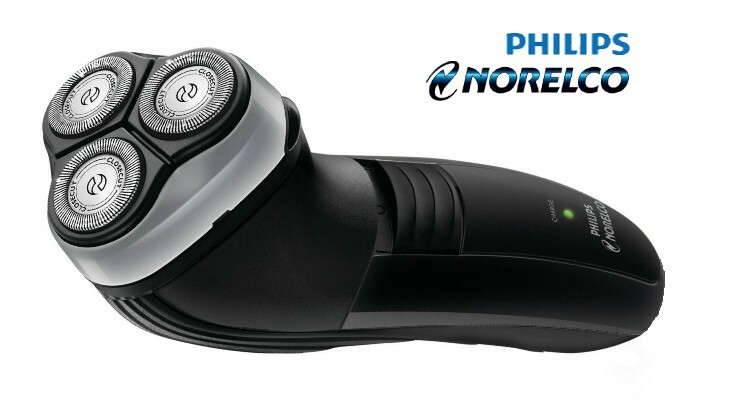 The Philips Norelco 6948XL/41 men’s electric shaver 2100 is an affordable shaver for men who prefer an electric shaver, but don’t want to spend a lot of money. 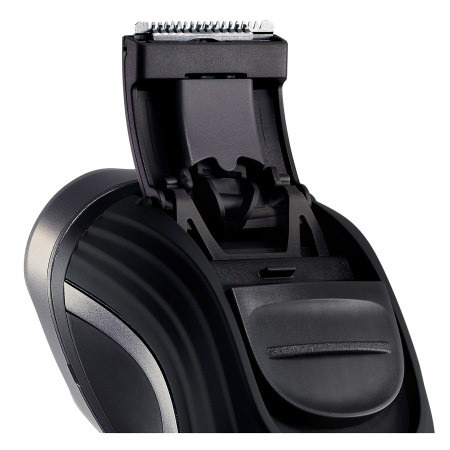 This shaver is mostly black, with a grey band around the base of the 3 rotary blades. It’s designed simply, without any fancy settings. The shaver has a rounded and curved body, making it easy to grip. This shaver was an older model but renamed to Shaver 2100 for 2015 . This shaver is meant to only be used dry, and not wet. If you need a bit of additional shaving help, you can always use Williams Lectric Shave to prep the surface of your skin. But don’t use it wet, in the sink, or the shower, and certainly not with any sort of shaving gels, foams, soap, or cream. You can still use shaving lotion and after-shave after you have finished shaving, but you may find that you don’t have any irritation with this type of shaver. 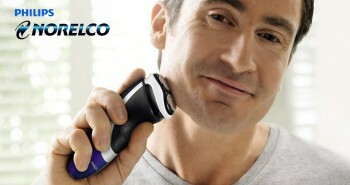 The Philips Norelco 6948XL/41 Shaver 2100 makes a great gift for a young man, or a person who enjoys travelling. Though this shaver will be perfect for anyone, and for everyday use as well. But you won’t balk at the affordable price point. Men who travel a lot may wish to purchase a second one to keep in their travel bag, so they don’t have to worry about packing at a moment’s notice. For those who travel, it will work for 100 to 240 voltages. You can just charge it up in advance and leave the cord at home, but with only a 35 minute shaving time, you may wish to bring the charger cord and adaptor plug with you on your travels. 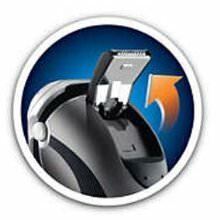 This shaver has “CloseCut” heads that promise to cut more than 25% more hair in one pass than other brands of men’s shavers. The blades built within this rotary style shaver are extremely sharp, and they’re also self-sharpening, as the sharper blades are, the less likelihood that they’re going to pull or tug at hair. Self sharpening blades mean that they aren’t likely to wear out. The self-sharpening blades also increase the length of time before you need to purchase new ones for your shaver. 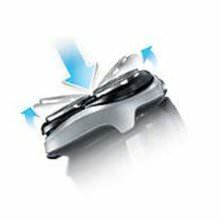 Philips has designed a patented “Flex and Float” system that enables each blade to independently follow the contours of your face. More hairs are captured in one pass, so additional movements back and forth are eliminated. This also has the additional benefit of minimizing any sort of irritation, as the less the skin is rubbed, the less chances that it will be sore or red after shaving. Even though this is a lower-priced model, the Philips Norelco 6948XL/41 Shaver 2100 flexes and floats across the face, which allows for a perfect shave. The shaver will have better contact with your skin, and it’ll catch more hairs in one pass. You’ll still get a fast quick shave, even though you’re paying less for this model. 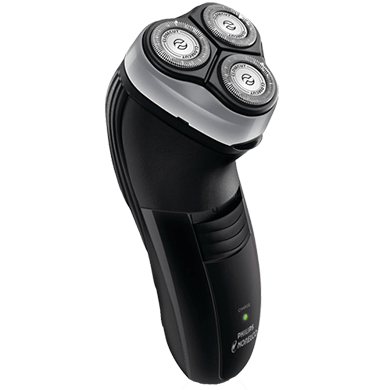 Philips has kept this affordable with a plain basic casing, with not too many fancy settings, but they certainly haven’t compromised on the internal quality of the shaver. There is a push on and off power button, and a green charge light. On the top back of the shaver is a pop-up hair trimmer, so men can trim off stray hairs from beard or mustache, or neatly trim around their beards. It’s also handy to trim those stray hairs that are on the back of the neck. It presses back down to close again. 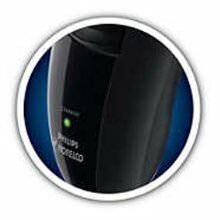 It takes eight hours to charge up the Philips Norelco 6948XL/41 shaver 2100. You may wish to plug it in overnight, so it’ll be ready for you in the morning. One full charge will get you up to thirty-five minutes of shaving time. Other shavers may do better, but keep in mind the price point of this shaver. Your other option is to use the shaver with the power cord, as it still does work that way as well. There is a charging indicator on the front of the charger with a battery status light, to help you determine how far along it is. It’s easy to clean the Philips Norelco 6948XL/41 shaver 2100 and it comes with a cleaning brush to help you get the job done faster. This shaver cannot be rinsed under the tap, but that won’t be necessary as you can’t use shaving gels, foams, or lotions with the shaver, and there’s no need to clean that stuff out when you don’t use it. Some men will pop the head out of the shaver, and then rinse that under warm running tap water. The brush can also help to get out any stray hairs. But it’s certainly not advised to rinse your entire shaver under tap water, as it is not waterproof, and you don’t want to risk electrocution if the power cord is still attached to the outlet on the wall. In the box you’ll get one Philips Norelco 6948XL/41 shaver 2100, a cleaning brush, a protective cap, and a corded charger. When you purchase your Philips Norelco 6948XL/41 shaver 2100 you’ll have a free forty-five day trial, to ensure that the shaver is right for you. The shaver is also backed up by Philips’s two year warranty that they promise on any model of their electric shaver line. 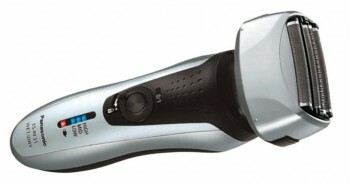 The Philips Norelco 6948XL/41 shaver 2100 measures 3.5” by 6.8” by 9.6”. It weighs only 14.2 ounces, so is light on the hands. Not everyone can afford an expensive cordless rechargeable shaver. 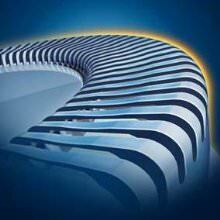 That’s why Philips has designed a great rotary model for men on a budget. You’ll be pleased at the performance of this men’s electric shaver. It may also be the gateway to the Philips brand: After you try this one out, you may be curious about some of the other higher end models in the line.